The Angeles Chorale is a 100-voice, auditioned, professional-level, volunteer choir based in Los Angeles, CA. 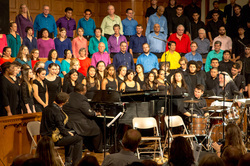 For more than 40 years we've brought inspiring choral music experiences to our Los Angeles community. Our mission is to engage, enrich and inspire our audiences, singers, and our diverse community by performing great choral music with a passionate commitment to excellence, and to increase access to and appreciation of choral music in greater Los Angeles. Recent Angeles Chorale performance highlights include appearances with Barbra Streisand in her Back to Brooklyn concert at the Hollywood Bowl and with Drew Carey and Julie Andrews in Holiday Sing-Along concerts at Disney Concert Hall. The chorale was honored to join the festival chorus with Gustavo Dudamel and the Los Angeles Philharmonic in Mahler’s 8th Symphony (the Symphony of a Thousand) at the Shrine Auditorium in 2012. Most recently, the chorale appeared with the LA Phil at the Hollywood Bowl in a 2014 special performance of An Evening of Chinese Splendor. The Angeles Chorale was founded in 1975 as the Valley Master Chorale by Bill and Ada Beth Lee under Bill Lee's artistic direction. The chorale merged with the Masterworks Chorale from Cal State Northridge in 1987 and performed under the baton of John Alexander for nine years. The name was changed to the Angeles Chorale during Mr. Alexander's tenure. Upon his departure, Donald Neuen, Director of Choral Activities at UCLA, stepped to the podium and led the organization for the next thirteen years, focusing on classical masterworks for chorus and orchestra. The 2017-18 concert season marks the eighth under Artistic Director Dr. John Sutton. 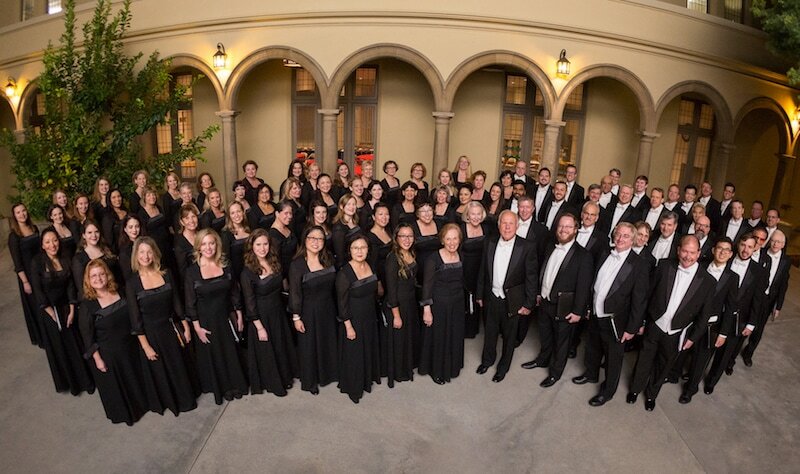 The Angeles Chorale has performed with many fine orchestras and choral ensembles including the Los Angeles Children's Chorus, Los Angeles Philharmonic, Hollywood Bowl Orchestra, Los Angeles Chamber Orchestra, Long Beach Symphony, Pasadena Symphony, and the American Youth Symphony. For the past several years, the Angeles Chorale has worked with Immediate Music, Megatrax, and Two Steps from Hell, leasing libraries for movie previews and television commercials. Chorale voices can be heard in many Hollywood movie trailers, including Harry Potter and the Deathly Hallows, Tangled, Meet the Parents: Little Fockers, and Prince of Persia. Who has sung with the Angeles Chorale in the past? View previous seasons to see what we've been up to! Your generous support is vital to our success.